The 8th Generation Intel Core i3-8130U is a mid-range dual-core laptop processor. The previous generation Core i3 chips are lower-mid-range CPUs and the i3-8130U is noticeably faster than them, so it is a mid-tier model. This advancement is enabled primarily with help of Intel’s TurboBoost technology, which is lacking on the 7th Gen and older i3 counterparts. TurboBoost allows big clock speed bursts – in this case from default 2.2 GHz up to 3.4GHz, in situations when a computing task requires that. Advantage of the Intel Core i3-8130U over its i3-7100U precursor, as well as other 7th Gen CPUs, is very visible in benchmark results. On the other hand, the i3-8130U noticeably lags behind other 8th Gen Intel Core chips, such as the widely used i5-8250U. 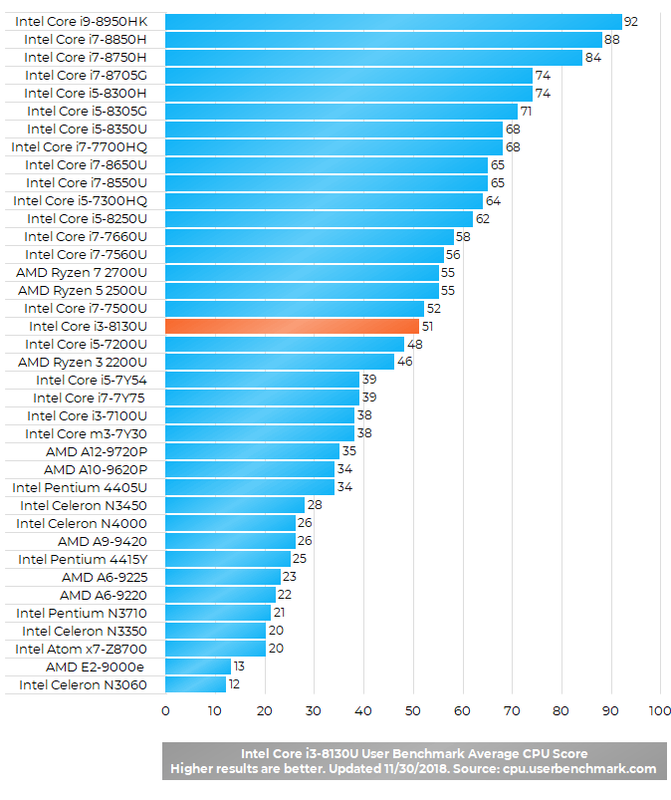 That’s primarily because the i5 has four processing cores as opposed to i3’s two cores. As for real-life use, the Intel Core i3-8130U is an excellent solution for the day-to-day computing tasks – web browsing, work in MS Office and other productivity software, or media playback. Investing in faster 8th Gen i5 and i7 makes sense if you do demanding tasks like video or photo editing on daily basis. In aforementioned routine daily tasks difference between the i3, i5, and i7 is barely noticeable. As for gaming, the i3-8130U with its Intel UHD 620 integrated graphics is capable of running only light games. But, many of the most popular titles, such as League of Legends or Minecraft, aren’t demanding and they can run on the UHD 620 quite smoothly. I bought HP156Laptop model 15-BS113DX for personal and business use. Tried to connect a power point file to an overhead projector without success. Does this computer not support that function? How are you connecting the laptop to the projector? Via HDMI port / cable? Have you tried to press Windows key + P on the keyboard and select the projector as the device to project to? Hi there! So I’m looking at buying a Levono 330 15IKBR. 8 gig ram with the Intel 8th generation core i3. I’m looking for web browsing/social media, streaming movies, and low key gaming (I’ve got the consoles if I want to play big). Do you suppose that machine will fit my needs? Thanks for reading! I would suggest you to make sure you have two RAM modules instead of one, if your model has two RAM slots, because that noticeably improves gaming on Intel graphics. Hi! I can buy a laptop with 8 GB RAM, 256GB SSD and this Core i3-8130U (8th Gen.). I use my computer for web browsing and Office, but I often have many documents and/or web pages open all at once. Will this be good? I can buy the same computer but with the i5-8250U for 200€ more, would it be better? I personally wouldn’t spend additional 200 for the i5 upgrade, unless it is for video editing and other heavy tasks. I would only consider getting 12GB or 16GB RAM because of heavy multitasking. But even 8GB can be enough if you don’t run tens of web tabs and programs at the same time. Hi there, I am planning to buy a computer with i3 8130u + 8GB RAM + 256gb SSD. The only thing I am concerned about is the processor. I am a computer science student and I mainly do web development on my laptop. My common work flow consists of writing and compiling code, watching youtube tutorials, making websites, testing the websites on different browsers. Is i3 8th gen capable enough for doing these tasks. Other then web development, online courses and browsing I don’t do anything else on my computer. So should I go for i3 8130u or save some money and buy a laptop with i5 8250u ? Hi, I’m not a pro developer, but I played a little bit with simple Angular, and php+MySQL+Apache projects. These seem to be light software regarding CPU usage. I used them on the i5-7200U which is very similar performance-wise to the i3-8130U and on the i5-8250U without noticeable difference. Maybe in some very intensive programming scenarios the i5-8250U will perform better, but for making usual web apps I don’t think you would benefit much by using the 8250U. Which laptop should i go with? I will be using it for web surfing, school work and microsoft office stuff. No gaming. Very basic stuff. Hi, the i5-7200U and i3-8130U are similarly fast. Both are excellent for the tasks you mentioned. I would choose Dell because HP’s 4GB RAM and 128GB SSD storage are on the smaller side and can be troublesome in some cases (small RAM can cause slowdowns when running multiple programs at the same time and small storage can slow down the system, if the storage is full). Assuming everything else is the same, I think additional $100 is a reasonable price for larger RAM and SSD capacities. Hello, I am a daily computer user with Office and online applications. I have an opportunity to purchase Intel Core 8th Generation i3-8130U with 128GB M.2 SATA3 SSD Class 20 or Intel Core 8th Generation i5-8250U with 1 TB SATA. (Same price) Thoughts? Hi, I would go for the i3 / 128GB SSD variant. That’s because SSDs greatly improve responsiveness of Windows and programs compared to hard drives, regardless of SSD class. However, if you store large amount of data on your laptop, then 128GB size can be an issue. You’ll have to avoid storing movies on it or installing large games. But for Office documents and other small files 128GB should be enough. For your Office and web tasks, the i5 doesn’t bring any noticeable improvement over the i3. would i be able to upgrade my i3-8130u? No, unfortunately. 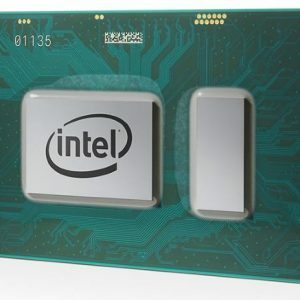 The i3-8130U and modern laptop processors in general are not upgradeable, since they are soldered onto the motherboards. Hello, I am a college student and I am not really sure how to choose my laptop. 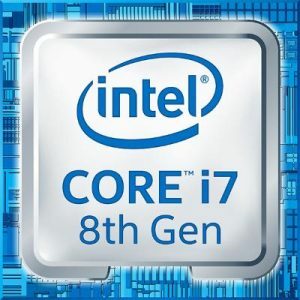 Will a Intel 8th Generation Core i3 be suitable for me because I am going to be taking online courses as well as doing homework and doing essays and I don’t want there to be any issues with my decision of purchasing this laptop. Thank you. Yes, the 8th Gen i3 is excellent for online courses, text processing, MS Office programs, and similar. You wouldn’t benefit from having a faster processor (like the 8th Gen i5 or i7), unless you do some heavy stuff like video editing, professional photo editing, 3D animations, OS virtualization, and such. But I would suggest you to get a laptop with at least 8GB of RAM, so you don’t have slowdowns when many browser tabs and programs run simultaneously. Also, an SSD drive instead of a hard drive will make everyday computing much smoother. Hi Danijel, I am currently using a core i3 7th gen laptop with 4GB ram. I would like to upgrate to i3 8th gen, basically because my I would do freelance typing over the internet. Please may I know if 8th gen i3 is suitable and the required ram for this purpose? Thanks a lot. Yes, the 8th Gen i3 is excellent for typing, but I would suggest you to also get 8GB of RAM if you run multiple programs and browser tabs at the same time. I assume you know you can’t upgrade the processor in your existing laptop, since the 7th Gen i3 (and almost all other laptop processors) aren’t upgradeable. Hi, good day. I am an online tutor and I am not a tech savvy person. I am teaching my students through video and phone calls in the internet. I am using some other platforms but skype most of the time and a browser with five to seven tabs simultaneously open and running during my class. Will a laptop with i3 and uhd 620 with 4 gb ram and 1tb storage be enough? I would also like to install NBA 2k19. By the way here are the specs of the laptop i am getting. Thank you so much. For Skype and web browsing it is fine. But, 4GB of RAM can be insufficient if you run many web pages in browser tabs plus other programs at the same time. So, I would suggest RAM upgrade to get at least 8GB of RAM (although 4GB is maybe sufficient for your work most of the time). Also, my suggestion is to get a laptop (or upgrade) with a solid state drive instead of hard drive (1 TB 5400 rpm SATA), because SSD makes user experience much smoother. As for NBA 2K19 and other games, the system isn’t a good choice, although it can run many games on low graphics detail settings, including NBA 2K19. RAM is again important in this case, since having dual-channel RAM (i.e. 2 x 4GB instead of 1 x 8GB or 1 x 4GB) can noticeably increase performance of the included UHD 620 graphics (which is the most important part for gaming). But if you want much better performance for games, a laptop with a dedicated video card (such as Nvidia GeForce) is recommended. Thank you so much Danijel Z. You are a very big help. More power to you and your site. Hi Danijel Z, it has been a while. I just saw a i3 8145u, well what can you say about it? Hi, it is slightly faster than the i3-8130U, but in the real world use the difference probably won’t be noticeable at all. Hi Danijel Z, it is me again. I just have a question which of these laptops specs do you prefer with my same purpose, skype and some web browsing. Hi, M.2 pcie SSD is the best among them performance-wise, but SATA SSD tech is quite close, at least for regular computing activities. The HDD / Optane option is noticeably slower than the SSDs. Thank you so much. Well I learned a lot reading your articles and I also read your article about this stuff but I am still confused about their real world performance. Well thank God you always there to help. More power Danijel Z! hi, i am looking to buy i3 8th generation does it good for visual studio 2017 and VM for linux oracle. basically i want to use this for development purposes. The i3-8130U is a great processor, but the i5-8250U 8th Gen is a better solution for these tasks because of its 4-core / 8-thread design as opposed to 2-core / 4-thread. Primarily because of virtualization you’ll be using. Looking to do some basic gopro editing once a month on a 8GB 1TB all-in-one. Will this processor suffice for that kind of work? Other than that, it’ll be our office computer for basic tasks. It’s good for occasional video editing and the daily office tasks, although it isn’t among the fastest laptop processors. I would recommend the quad-core 8th Gen i5 or i7 or even faster 8th Gen Core i5 and i7 H-series if you often do Ultra HD 4K video editing. Otherwise, the i3-8130U is sufficient, although it is slower than the aforementioned i5 and i7. That will be noticeable when exporting finished videos. You’ll have to wait a bit longer with the i3, but the tasks will be finished anyway. During regular office use, speed differences between the i3 and i5 / i7 won’t be noticeable. I intent to run Virtual Machines using VMware workstation. Will this processor be better than 7130U for running Virtual Machines. I haven’t tested that, but judging by the specs I would say the i3-8130U is better than the i3-7130U for virtualization. The 8130U has TurboBoost, which allows higher max. clock speed of 3.4 GHz as opposed to 2.7 GHz and it has 4 MB cache instead of 3 MB. On the other hand, both are 2-core / 4-thread chips, so I don’t thing that the difference is significant when it comes to virtualization and other tasks. Could it run fortnite smoothly? What games that compatible with this intel core i3-8130u with Intel UHD Graphics 620? That’s the same graphics processor as in the i3-8130U. Because the i3 is somewhat slower than the i5, performance will be slightly worse on the i3. Also, if your laptop has one RAM module instead of two, performance will be worse than presented in the review (I used dual-channel 2 x 8GB memory). I am thinking of purchasing a laptop with i3-8130U with dedicated GPU nVidia MX130 on it. So will it be good for a daily use like multimedia, internet and bit of some games like Rise of the tomb Raider ? Hi, it’s excellent for a daily multimedia, web, office use. As for gaming, Rise of the Tomb Raider is a heavy game for the MX130, which is a very basic dedicated video card. However, you’ll be most likely able to play Tomb Raider on low graphics settings and resolution like 720p. The same applies to the most of other heavier games like GTA 5. Some older games like CS:GO or League of Legends are lighter and more suitable for the i3-8130U / MX130. Hi , laptop with i3 8130u / mx150 would be good to fortnite? Hi, I don’t own a laptop with the i3-8130U / MX150, but based on my experience with similar laptops I would say Forntnite will run for sure at least at around 50 fps on medium settings (and possibly higher). On low settings it should be at least around 100 fps.